We finally got there, my finding place. I got out of the car and just stood there. I saw her; there she was, with rich, black hair and eyes like chocolate. You would just get lost in them. She was holding me tight as I was wrapped in her arms. She kissed me and laid me there. I could see the tears run down her cheek. I could feel her sorrow. The feeling when someone just rips out your heart. How could she do this? If it hurt so badly, why would she give me up? But then I realized she did this for me so that I could have a great life. Her dream for me was that there would be a family that would love me and take care of me, just as she would. I could feel the tears in my eyes, the tears of Joy and Happiness. They were pouring down my face. I got in the car and, with the silence, I looked back and she saw me through the glass. We both smiled, and that's when she knew that I would be happy. 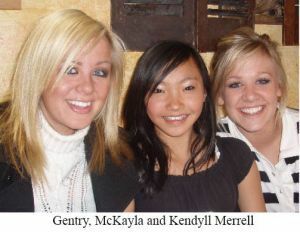 Biography: McKayla Joy Merrell was adopted from China by the Merrell family when she was two years old. She weighed only 13 pounds and could not walk or crawl. Within two weeks after she was home, she started walking and has been in motion ever since. She is now 14 and in eighth grade. She excels in math and is taking Algebra this year. She also loves soccer, snowboarding, playing the piano, music and the Disney Channel. McKayla attended the FMIN Women's Conference in Estes Park, Colorado, this past April and was listening to Claudia Porter talk about how she and her adopted daughter, Hannah, went back to China and visited the orphanages there. Claudia talked about how they call the place where Chinese children are abandoned their "finding place." As McKayla listened, she started writing this story and within ten minutes it was done. When she read it to us we all cried as it came from her heart.